Apple’s iPhone and iPod Touch are as popular as ever, and they also make extremely popular Christmas gifts. As soon as people get them unwrapped, they are instantly looking for what apps they should download, but sorting through hundreds of thousands of apps is no one’s idea of a good time. We’ve gathered up 40 of the best across eight different categories to help you get a start wit your new device. Oh, and best of all, we only picked free ones. We will warn you that developers can change the price on an app at any time, so do double check the price before downloading it. Dropbox: Get access to all of your Dropbox files while on the go. You can download them into other apps, view them, add videos & photos taken with your iOS device to your account and several other features. Evernote: Evernote allows you to keep track of thoughts and ideas while on the go. Create text, photo and audio notes that are automatically synced to your computer or the Web based interface so you’ll never lose track of an idea again. Genius Scan: Genius Scan helps you keep track of receipts, business cards and any other little notes that might get lost in the shuffle of a busy trip by taking images of the important documents and notes. You can then send these via e-mail as JPGs or PDFs. 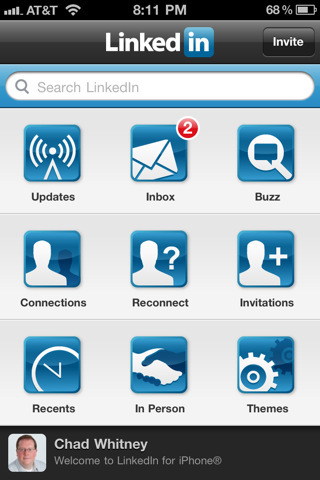 LinkedIn: LinkedIn is a social network for professional communication that allows you to view people’s resumes, message one another and see updates from people in your professional network amongst other features. UPS Mobile: With UPS Mobile you can track multiple shipments, create new shipping labels and locate shipping centers near you for easy drop off. Bump: Nothing can be more frustrating than trying to give someone all of your details upon meeting them. Well, if both of you have bump installed, you can easily transfer contact info and more to one another by simply opening the app and then “bumping” your phone together. 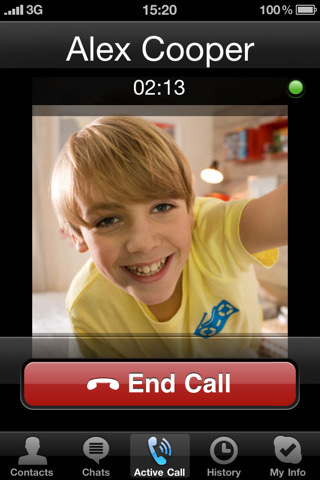 Fring – Video Calls + IM: Allows for free video calls over 3G and Wi-Fi to any other type of cellular phone. Also provides instant messenger access to Facebook, Google Talk, MSN Messenger, SIP, Twitter and Yahoo. IM+: Pretty much a “one stop shop” for all of your IMing needs with support for AIM, Facebook, GTalk, Jabber, MSN/Live Messenger, MySpace, Twitter and Yahoo. You get a centralized friends list so you don’t have to flip back and forth to find people, push notifications of new messages and more. Skype: The official application from Skype allows you to make free Skype-to-Skype calls over Wi-Fi and still access their low international rates to call people in other countries. TextPlus: This app provides you with your own phone number so that people can text you just like they would anyone else, including to the iPod Touch. Works in the U.S. and Canada, send images, form group chats, even use it when out of the country so long as you’re on Wi-Fi it will remain free and lots of other features. Amazon Kindle: The Kindle app from Amazon gives you access to all of the books you’ve bought from the company no matter which device you did so from. You then can have them sync across readers so no matter where you leave off reading on one, you’ll pick up in the same spot on another. 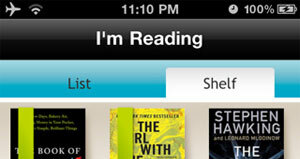 Barnes & Noble NOOK for iPhone: Nook from Barnes & Noble will let you see a sample of any book in the inventory and also includes the exclusive LendMe technology which allows you to lend books to other Nook users. 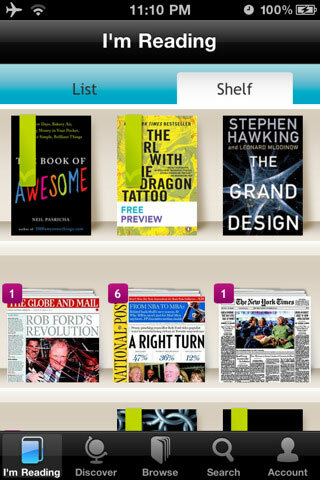 Borders eBooks: Sitting as the second largest retail chain of bookstores in the United States, Borders has entered the digital age with its own e-reading app for iOS devices. iBooks: Apple’s official e-reader app features allows you to buy books from Apple itself and also synchronize your books and reading with your other iOS devices with the app installed. Kobo: Kobo offers its own bookstore, but you can also load your own PDFs and EPUB formatted books, look up highlighted words in a dictionary or in Wikipedia, newspapers & magazines available and more features. 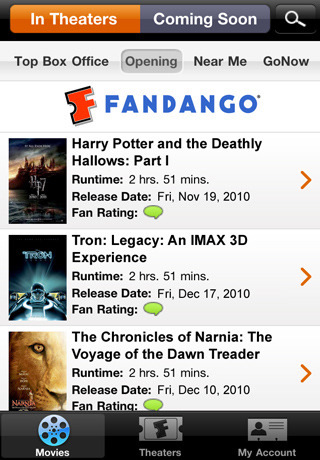 Fandango: Fandango allows you to locate nearby theaters, prioritize ones starting in under an hour if you’re in a hurry, see trailers, read Tweets about the film (i.e. find it if you should bother seeing it) and even book your tickets all from your iOS device. IMDb Movies & TV: Ever wish you could quickly settle those inevitable bar bets about who that one guy was in the one movie … you know the one! With the Intenet Movie Database app you can quickly access all of that information and get your beer from that guy in just a few minutes. Movies: The Movies app from Flixster allows you locate theaters near you, browse their schedules, watch trailers for the films and look up reviews from Rotten Tomatoes for any of the movies. OneTap Movies: OneTap Movies gives you access to Fandango ticket purchasing as well as sorting movies by theaters, popularity, star ratings, newest releases, and additional info based on boxoffice sales. You can also check out reviews, view trailers and a host of other features. Redbox: Why bother getting to the nearest Redbox just to discover it doesn’t have the movie you wanted? With the Redbox app you can locate the nearest kiosk to you, see what films are in it and search through all of the other machines in your general vicinity. Once you find the one you want the app will even map out a route for you. Last.fm: Last.fm gives you access to your account, tagging songs and exploring what your friends have been sharing. NPR Music: National Public Radio (NPR) is mostly known for news shows, performances and weekly shows such as Car Talk, but it is is also a great source for off the beaten track music. This app will give you access to music such as Pop/Rock/Folk, Jazz & Blues, World, Classical and Hip Hop/R&B. 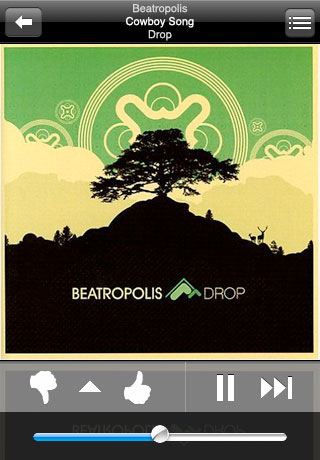 Pandora: It’s Pandora … do you really need to say any more? If there is only one music app you download for your iPhone or iPod Touch, this is the one for you. Features everything you love about the Web version such as creating new stations based on a song or musical group, vote on songs and more. Slacker Radio: The popular streaming music service made up of user created channels of over 100 preset selections allows you to explore a wide selection of musical styles. Stitcher Radio: Stitcher Radio allows you to stream music stations from around the United Sates as well as numerous podcasts without having to download them. 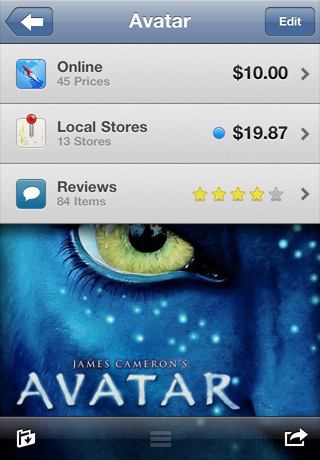 Great app for those that don’t sync their iOS devices all that often with iTunes. CNET Reviews: Look up CNET reviews of gadgets and appliances while you’re out shopping so you can learn if that “bargain” you’ve stumbled into is really even worth the discounted price you’re about to pay. eBay Mobile: Find items to bid on or buy, keep track of your auctions, access your saved searches & messages and more. Groupon: Access your Groupon account to pull up all of your purchased deals and even explore new offers while on the go in case you run into a business you think may have a deal you want. Price Check by Amazon: Another price checker application, but this one only works with Amazon, but considering how they carry just about every imaginable item, it might as well be the one you use. You can scan, speak or type the item, and if you find it cheaper in the app, you can order fdirectly from there. Shop Savvy Barcode Scanner: Using the iPhone or iPod ouches camera you can scan the barcode of an item and find information about it on the Web such as prices and reviews, as well as learn what stores around you locally carry the item and at what prices. 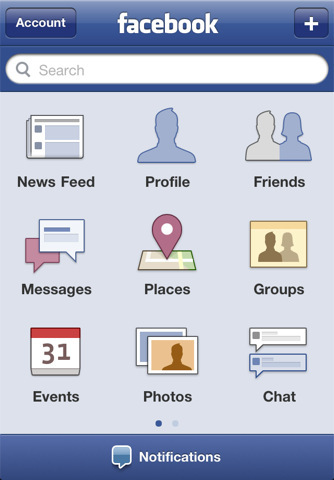 Facebook: Get access to all of your favorite Facebook features such as status updates, checking messages, uploading mobile photos on the go and more. Foursquare: Foursquare lets you discover what is around you, check-in to locations to earn discounts, see where your friends are and several other features. Gowalla: While Gowalla is considered the second biggest location based network and focuses on being more graphically engaging than Foursquare, it awards you with random items you find at locations, awards you with pins for different activities and follow the locations of your friends. Twitter: The official Twitter application gives you access to all of the best features of the service and will also let you turn on push notifications so you are automatically notified of new messages. Yelp: Yelp is a mixture of a social network and a location-based app with its primary focus being a social review service. The service has already been around for years as a Web app, and with its move to mobile it makes it easy for you to find businesses around you and see reviews while out and about. You are also encouraged to add your own reviews to the site to keep building up the service. Cheap Gas! : See gas stations near your location and the prices as reported by other users so you can find the best price without having to drive around aimlessly looking for it, burning more in gas than you’d save. OpenTable: See what restaurants are near your location (so long as they participate in OpenTable), reserve tables and get them confirmed all without having to make phone calls. Taxi Magic: When first arriving in a new city, it can be frustrating knowing where to find cabs. 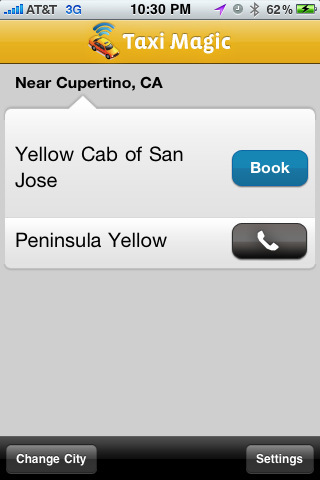 With Taxi Magic you just set up an account, use GPS to locate yourself and then choose from a list of taxi companies that service the area to summon one to you. You can also pay via the app if you so choose. The Weather Channel: A gorgeous looking app that brings you all of the most pertinent weather information for the city you’re in and the ones you may be traveling to. Wi-Fi Finder: Locate both pay and free Wi-Fi spots near you, narrow them down by providers, types of business and more. Perfect for when you’re in a city on business that you aren’t familiar with.